Whenever you need cabling and bracing services, it’s important to know what you’re doing in order to complete the job effectively. As skilled arborists, we are expertly trained to help you execute your cabling and bracing effortlessly with the tree cabling service offered at Hendrickson Tree Care. Our tree care services are quite popular in the KC area, and we will gladly help you your tree cabling/bracing needs. A certified arborist can conclude whether one of the following techniques will be beneficial for the survival and longevity of your tree. In addition, these techniques are sometimes necessary for human safety. Arboriculture has included the practice of cabling and bracing since the early 20th century. The main objective to cabling/bracing is safety. That is, the safety of the inhabitants of a property and the safety of a valuable tree. Potentially weak, dangerous limbs can be prevented with specialized observation and planning. 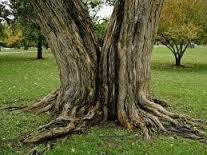 Certain tree species may develop a weak crotch (split in the tree trunk) and weak limbs as they grow over time. These “weak” areas can result from a lack of pruning, incorrect pruning and/or inaccurate timing when pruning. Also, multi-stemmed trees are especially susceptible to breaking under the stress of wind. Likewise, as our Kansas City patrons know all too well, the weight of accumulated ice and snow can cause even large limbs to break under pressure. The two main types of tree cabling, include, invasive and non-invasive. Invasive cable means we have to drill a hole to install some form of hardware. Non-invasive means we do not have to drill into the tree. We have many types of cable we can install. We have been installing cables for over 30 years and as new products come to the market, we analyze them and test them. Your sales rep or arborist will advise you of the best cable option for your situation. Tree bracing is the use of steel rods to add rigid support to a tree for weak areas, split crotches and reinforcing decayed areas (most of the time this method is used in combination with cabling). The experts at Hendrickson Tree Care can determine when cabling/bracing would be ideal and what method should be executed to ensure your safety and the durability of your trees. Hendrickson Tree Care proudly supports the use of the Cobra Dynamic Bracing System, Tree Save and Branch Save cable systems. Tree cabling and tree bracing are important services for ensuring a high-level of care for our Urban Forest in Kansas City. With over 30 years of serving the local area, we come well-prepared to ensure safety and ensuring positive growth for the trees under our care. We can help you with tree cabling and bracing services for commercial and residential customers.